Deputies said they found in her home more than 300 empty blister packs that had contained more than 10,000 tablets of the various medications. SPRING HILL – A nurse has been accused of stealing drugs from the rehab center where she worked, the Hernando County Sheriff’s Office said. Ashley Kristian Taylor, 33, of Spring Hill, was charged with 12 counts of possession of a controlled substance and one count each of grand theft of a controlled substance, scheme to defraud to obtain prescriptions, and obtaining a prescription by fraud. Deputies were notified Tuesday (July 24) when administrators at the Spring Hill Health and Rehab Center, 12170 Cortez Blvd. in Spring Hill, reported a theft of medication from their facility. Administrators identified Taylor, a nurse at the facility, as the suspect. Hernando sheriff’s deputies contacted Taylor on Wednesday (July 25) when she reported for duty at the rehab. Deputies said she admitted to fraudulently obtaining Norco, alprazolam hydrocodone, Percocet, morphine, morphine sulphate, clonazepam, temazepam, hydromorphone, hydrocodone, codeine, and dilaudid while on duty and assigned to the narcotics cart at the facility. Taylor said she would order extra medication from the pharmacy to ensure that none of her patients went without their prescribed medication. Upon signing out the medication, Taylor told deputies that she would conceal it on her person and take it home so she could take it later. Taylor said that she has been battling an extensive drug addiction for many years, after suffering an injury. Taylor was cooperative with the investigation and allowed detectives to retrieve items, related to the thefts, from her home. 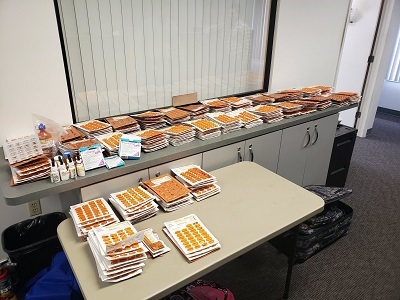 Upon arrival at her home, deputies said they found more than 300 empty blister packs that, at one time, had contained more than 10,000 tablets of the various medications listed above.